I saw this article today in the Journal and immediately wanted to share it with you as it was one of the best argued cases for continued strength of the U.S. Manufacturing base and its ability to compete long-term with foreign countries. My own experiences entirely support this view. The average American factory worker today is responsible for more than $180,000 of annual output, triple the $60,000 in 1972. Is American manufacturing dead? You might think so reading most of the nation’s editorial pages or watching the endless laments in the news that “nothing is made in America anymore,” and that our manufacturing jobs have vanished to China, Mexico and South Korea. Yet the empirical evidence tells a different story—of a thriving and growing U.S. manufacturing sector, and a country that remains by far the world’s largest manufacturer. This is a particularly sensitive topic in my hometown of Flint, Mich., where auto-plant closings have meant lost jobs and difficult transitions for the displaced. But while it’s true that the U.S. has lost more than seven million manufacturing jobs since the late 1970s, our manufacturing output has continued to expand. International data compiled by the United Nations on global output from 1970-2009 show this success story. Excluding recession-related decreases in 2001 and 2008-09, America’s manufacturing output has continued to increase since 1970. In every year since 2004, manufacturing output has exceeded $2 trillion (in constant 2005 dollars), twice the output produced in America’s factories in the early 1970s. Taken on its own, U.S. manufacturing would rank today as the sixth largest economy in the world, just behind France and ahead of the United Kingdom, Italy and Brazil. In 2009, the most recent full year for which international data are available, our manufacturing output was $2.155 trillion (including mining and utilities). That’s more than 45% higher than China’s, the country we’re supposedly losing ground to. Despite recent gains in China and elsewhere, the U.S. still produced more than 20% of global manufacturing output in 2009. The truth is that America still makes a lot of stuff, and we’re making more of it than ever before. We’re merely able to do it with a fraction of the workers needed in the past. Consider the incredible, increasing productivity of America’s manufacturing workers: The average U.S. factory worker is responsible today for more than $180,000 of annual manufacturing output, triple the $60,000 in 1972. Increases in productivity are a direct result of capital investments in productivity-enhancing technology, such as GM’s next generation Ecotec engine. These increases are a direct result of capital investments in productivity-enhancing technology, which last year helped boost output to record levels in industries like computers and semiconductors, medical equipment and supplies, pharmaceuticals and medicine, and oil and natural-gas equipment. Critics view the production of more with less as a net negative—fewer auto plant jobs mean fewer paychecks, they reason. Yet technological improvement is one of the main ingredients of economic growth. It means increasing wages and a higher standard of living for workers and consumers. Displaced workers learn new skill sets, and a new generation of workers finds its skills are put to more productive use. Our world-class agriculture sector provides a great model for how to think about the evolution of U.S. manufacturing. The U.S. produces more agricultural output today—with only 2.6% of our work force involved in farming—than we did 100 years ago, when farming jobs represented almost 40% of the labor force. Likewise, we’re able to produce twice as much manufacturing output today as in the 1970s, with about seven million fewer workers. That means yesterday’s farmhands and plant workers can become today’s computer engineers, medical doctors and financial managers. I don’t deny that the transition to this new economy can be a rough one for displaced workers. But turning back the clock to a less efficient economy is not the answer. Instead, let’s retrain our work force to participate in this dynamic new economy—an economy that still supports America’s status as the world’s leading manufacturer. You either don’t do it, or do it. But if you choose to do it, do it right. I am talking here about direct investment into foreign markets. As once you decide to do it, you have to commit and you cannot be scared. There may be military coupes, economic and political crises, disease pandemics, natural disasters, competitive threats, criminal threats and other very unpleasant events. Each one has to be carefully and rapidly assessed, and in some cases any of these events, or a combination of them, may force you to abandon your chosen market. More often than not, however, these events are precursors of bigger and better things and overcoming them may be a highly rewarding experience down the line. The article below underscores a very important aspect of doing business in Emerging Markets. In-depth understanding of the situation, long-term view and ability to adjust and adapt to most extreme scenarios. Soldiers at the stock market in Cairo. As the Egyptian revolt unfolded, 13 Arab bourses lost nearly $50 billion in value in a week. With the global markets on the mend last fall, a private equity consortium moved to sell its 93 percent stake in the Egyptian drug maker Amoun Pharmaceutical. In January, the consortium of American investors, including a Citigroup fund, seemed hopeful they could sign a deal for $1 billion, more than triple what they paid in 2006. But as student protests in the country turned to revolutionary upheaval, buyers never materialized. Now, the deal is up in the air, a person with knowledge of the situation told DealBook, speaking on the condition of anonymity. After two years in a state of paralysis, foreign investors slowly began returning to the Middle East late last year, with deal volume showing a modest uptick. But in the wake of the uprisings in Egypt and Tunisia, deal makers in the region have once again grown cautious, concerned about economic instability and market volatility. Discover export opportunities and expand your company’s global reach at this International Trade Forum. U.S. Department of Commerce Senior Commercial Officers from Africa, the Middle East, and South Asia regions including Afghanistan, Algeria, Egypt, Ghana, India, Iraq, Israel, Jordan, Kenya, Kuwait, Lebanon, Libya, Morocco, Nigeria, Pakistan, Qatar, Saudi Arabia, Senegal, South Africa, and the United Arab Emirates will provide information, help you identify new export markets and develop market entry strategies. For more information, please contact Larry.Tabash@trade.gov. 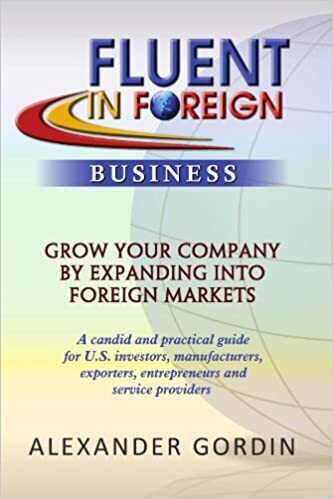 How international is your company? Yet the risks of doing business in some of those countries may far outweigh the rewards. Risk factors range from reputational and financial to health and life. It is crucial to develop a sober risk-assessment framework and view it side-by-side with possible opportunities. Always evaluate “Upside vs. Downside.” I’ve told this to my sons for as long as I can remember and when doing business abroad, this maxim may one day save your life. I believe that we should always worry about protecting our four most valuable assets– life, health, reputation and property. Understanding the downside of every action and transaction is vital. Things are not the same abroad as they are here at home. In the U.S. you can go to court to get satisfaction, call the authorities or the police. But in many foreign countries, especially emerging markets, you are more likely to be confronted by hoodlums, crooked cops, reporters or inspectors who will try to shake you down or bend you to their will. If they don’t get their way, you could become a victim of a shooting or a beating. My advice: Be careful. You must also try to predict the worst possible outcome of a particular deal and how it could impact your four most valuable assets. It may not always be possible to assess every risk, as in the example above, but an in-depth analysis is needed in every case. When structuring a transaction, you must understand who the players are, who stands to lose, how much and what are you prepared to do if someone approaches you with a threat, whether veiled or explicit! Will you run, withdraw, proceed, or attack? These are serious questions that require sober and realistic assessments of your capabilities, your reputation and potential damage to your four most valuable assets, as well as your financial condition and your desire to stay in the market. Then you need to think about this: How likely are you to succeed and reach your dreamed-about lucrative goal, or do you run the risk of being damaged in the process while the opportunity itself is uncertain? This falls into the “worst possible outcome.” Will involvement in the project place you on the wrong side of the political powers of the country you’re entering? More cautions: How secure is your business, your person, your information? Are competitors spying on you? It happens more that you may think, especially abroad. Could you be caught in the crossfire of battling forces and be splattered in the process? What happens if the nation’s ruling party, or the senior leadership of your prospective customers changes? In the movie “Heat,” actor Robert DeNiro’s character defined his strategy for survival: “Don’t let yourself get attached to anything you are not willing to walk out on in 30 seconds flat if you feel the heat around the corner.” A similar strategy should be employed when doing business abroad. You may be asking, “Why would anyone spy on me, or have reason to harm me? I’m just a simple businessperson and my company sells basic consumer products.” You may be right, but you also may severely underestimate what’s really going on. For example, what if your competitor, a local oligarch, is selling a similar product in the country and dominates the niche, with a solid and consistent cash flow? This person would not take kindly to your intrusion into his market space, and he or she would have the resources to conduct commercial espionage, and may chose to engage in discreditation in the press, or even more sinister activities. Do you have contingency plans? These could range from leaving the country in a hurry to having a crisis management plan, to medical evacuation insurance or having an idea of where you can borrow a few hundred bucks in case your wallet is stolen. If your company has physical assets, invest in political risk insurance that covers expropriation, nationalization, terrorist acts, currency inconvertibility and a host of other risks. Insurance may also be available for other politically charged commercial risks when bidding on certain contracts, financing from local banks or bonding customs shipments. Such insurance may be available from Overseas Private Investment Corporation (OPIC), Multilateral Investment Guarantee Agency (MIGA), or private insurance companies. You also should assess the potential rewards as they relate to the extra risk you take on. Selling your goods or services at a modest mark up, as you may do back home in the face of stiff competition, may not be worth enough if the risks are significantly higher. Even though your product or service offering should be competitively priced, you should NOT be involved in doing business abroad if you are not able to price your services to include all the risks that exist. If you are not able to evaluate this on your own, hire professional advisors, but make sure your upside is always much greater than the downside. Alex will be moderating The International CEO Roundtable on February 17th in Manhattan. This unique and timely CEO roundtable is designed to produce informative discussions between business leaders that operate in the international arena. Attendees will walk away with new ideas and the latest best practices from other CEOs which they can implement into their own businesses. To request an invite to this event, visit www.nyreport.com/roundtableinvite.